Electoral review of Rushcliffe Borough Council. The Commission is carrying out an electoral review of Rushcliffe in order to improve the levels of electoral representation which have become imbalanced since the last review. The number of electors represented by the councillors in nine of the 28 wards varies by more than 10% from the average for the borough. The aim of the review is to recommend ward boundaries that mean each councillor represents approximately the same number of electors. Furthermore, as it draws up new electoral arrangements for an authority, the Commission must also have regard to the interests and identities of local communities as well as ensuring that the new electoral arrangements promote effective and convenient local government. 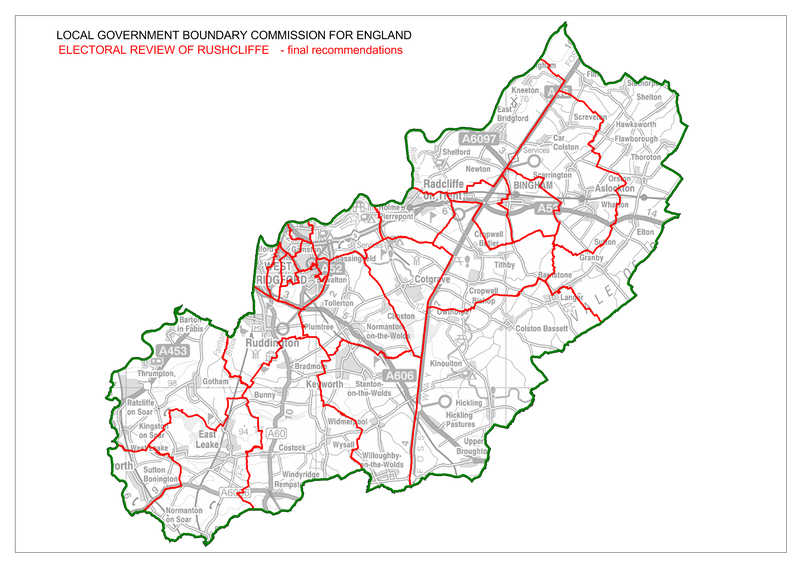 The Rushcliffe (Electoral Changes) Order 2013, to implement recommendations made by the Local Government Boundary Commission for England (LGBCE) for new boundaries in Rushcliffe, was made on 30 October 2013 and was published 4 November 2013. New ward arrangements for Rushcliffe have now successfully completed a 40 day period of Parliamentary scrutiny and will come into force at the local elections in 2015. On 18 July 2013 The Rushcliffe (Electoral Changes) Order 2013 was laid in draft in Parliament. The draft order if made would give effect to the final recommendations that were consulted on during the Local Government Boundary Commission for England's review of electoral arrangements in Rushcliffe and published on 19 February 2013. The draft order will be laid in Parliament for a period of 40 sitting days. Parliament can either accept or reject our recommendations. If accepted, the new electoral arrangements will come into force at the next scheduled elections for Rushcliffe in 2015. On 19 February 2013, we published final recommendations for future electoral arrangements in Rushcliffe Borough Council. The report is available in the link below. To interact with the final recommendations mapping visit our consultation area. You can view both the existing and proposed boundaries and search by area or postcode. Below is an overview map of the final recommendations; click on the image for more detail. We have now completed our electoral review of Rushcliffe Borough Council. The changes we have proposed must be approved by parliament. A draft Order - the legal document which brings into force our recommendations will be laid before parliament. The draft Order will provide for new electoral arrangements for the council to be implemented at the local elections in 2015. On 18 September 2012 we published our draft recommendations for the further electoral review (FER) of Rushcliffe Borough Council. These can be found using the links below. Please note: this map may be large and take some time to download. You may find the electorate figures (XLS) and a map of the parished and unparished areas (PDF) useful when thinking about our draft recommendations for the borough. We received 6 submissions from local councillors. All submissions are contained in one document. At the front of the document there is a list of names with links to the relevant submissions. We received 7 submissions from Parish, Town Councils. All submissions are contained in one document. At the front of the document there is a list of names with links to the relevant submissions. We received 8 submissions from local residents. All submissions are contained in one document. At the front of the document there is a list of names with links to the relevant submissions. We also received 1 additional submission after the consultation date. Following preliminary discussions with Rushcliffe Borough Council, on 27 March 2012 we started a period of information gathering for new ward arrangements for the council. Between 27 March and 18 June, we are inviting local people and other interested parties to provide information on new warding arrangements for the authority. We are especially looking for information on communities within Rushcliffe, how people relate to and interact with them and how this may relate to any new ward boundaries. During the preliminary consultation the Commission received submissions from Rushcliffe Council, political groups and local residents. These submissions are available below. The Commission has considered these proposals and is minded to recommend a council size of 45 for Rushcliffe. Proposals for warding arrangements should therefore be based on this council size. You may find the electorate figures (XLS) and a map of the parished and unparished areas (PDF) useful when thinking about the warding arrangements for the borough. On 17 January 2012, the Commission started a review of Rushcliffe Borough Council. From 17 January to 27 February we consulted on the size of the council, namely the number of councillors representing Rushcliffe Borough Council. Following discussions with Rushcliffe, the Commission asked local people and groups whether they thought the Borough Council should be served by 45 councillors: a reduction of 5 from the current arrangements. Consultation closed on 27 February 2012. Labour Group (PDF) submission and a second (PDF) received on 23 February. Liberal Democrats Group (PDF) and an additional submisson (PDF) received on 23 February. We only considered comments on council size at this time, but there will be further consultations in 2012. Our technical guidance: Electoral Reviews: Technical Guidance (PDF), contains detailed guidance on the review process and information on the legislation reviews are carried out under. Draft report (PDF), published on 14 December 1999.